Electricity Use: ongoing monitoring w/ total energy threshold of 11,007 kWh/yr. Heat Recovery Ventilation Here are some of the highlights of the Deep Energy Retrofit of this transformed 1903 Bungalow. Attic, Roof: R-60 (10"Icynene 4" Rigid Polyiso Foam added to exterior). Walls: R-40 (4" Rigid Polyiso Foam added to exterior, 2 layers interwoven for no thermal breaks). Windows: R-5 (0.2 U-value) Paradigm triple glazed, low E, argon filled. Air leakage reduction: 85% from initial leakage 5050 cfm at 50 Pa, final 762 cfm at 50 Pa. Heating system: 96% eff Phoenix Evolution, integrating solar & back up water heating, radiant slab & hydro air. Cooling: Carrier Air to Air Heat Pumps, COP 4.08 @47*F. 2.80@17*F. Heat Recovery Ventilation: Lifebreath HRV, 88% efficient heat recovery. Lighting: Compact Flourescent or better throughout. Appliances: all ENERGY STAR. 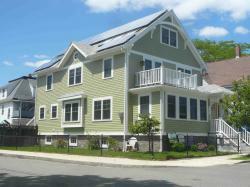 Renewables: Velux integrated Solar DHW & a 6.25 kW Solar PV w/ Sun Run Residential Power Plan. Acceptance into the ACI 1000 Home Challenge, ongoing monitoring w/ total energy threshold of 11,007 kWh/yr. 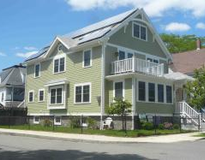 This National Grid Deep Energy Retrofit project (in the final phase of construction) began in April of 2010 achieving Town approval for set back findings to add a full new 2nd floor to the project, a fully functioning attic for home offices, and a comprehensive basement renovation and new insulated radiant slab. While the original footprint of the home has not been altered with the exception of new decks, the usable space has increased 34% from 2,647 to 3,560 SF. 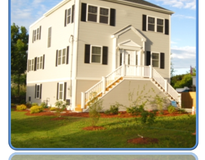 The super insulated enclosure was substantially enhanced through financial and technical support from National Grid through a technical partnership with Building Science Corporation and the DOE's Building America Program. In addition to significantly reducing it's energy use, the building is also supplying over 50% of its annual fuel needs with Solar Electric and Solar Thermal panels, fully exposed on the south side of this highly visible corner lot with exceptional solar exposure. The combined focus on energy efficiency and renewables have earned the project a Home Energy Rating (HERS) of 26 . The home is also participating in the National Thousand Homes Challenge - an ambitious program to showcase very significant energy use reductions existing homes. Ongoing monitoring is being performed by PowerHouse Dynamics and Solar Wave Inc. This project is the first single family home of its kind to be built in Quincy.